Ziptrak Blinds & Zipscreen Blinds - What are the differences? 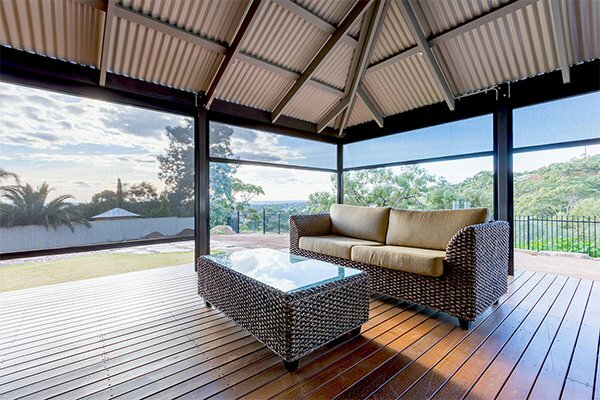 Alfresco entertaining is a major part of Adelaide living. With so many options for sun protection and outdoor blinds, we want to help our customers choose the right blind. Stan Bond is the only authorised manufacturer and wholesaler of both Ziptrak Blinds by Ziptrak and Zipscreen Blinds by Acmeda as well as other related products. Often we get asked what the difference is and which one is better. Both are great systems but have different strengths and weaknesses. A review of the differences is important before you make a decision. Note – Ziptrak® is a trademarked product and has patented design elements. Zipscreen is a registered product. This article constitutes the opinion of the writer, an opinion which may not be universally agreed. Ziptrak Blinds were designed by a South Australian company which manufactured Roller Shutters and External sun shading system. They designed Ziptrak because people did not want gaps and wanted a product that was easy to operate. At the time it was quite niche and looked agricultural partly because it used a mix of parts already in the market place. The designer of the system improved parts and designs, has specifically designed brackets and plastic components. Around 6 years ago a number of manufactures recognised the market needed a system like this and the owner of the system offered the product to the market place. Stan Bond started manufacturing Ziptrak’s soon after this. 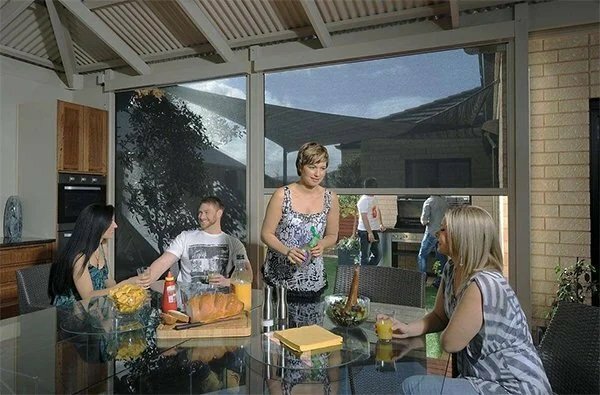 Over the past 6 years Ziptrak Cafe Blinds in Clear PVC and Mesh fabric have become hugely popular and now are the most popular single blind external system sold in the Adelaide market. The important element to note here is the system was designed here in South Australia for SA conditions. Ziptrak Blinds are often mis-named as Ziptrack Blinds, Zip Track Outdoor Blinds, Ziptrak Cafe Blinds or Zip Trak Blinds. All of them are them are the same registered product. Strangely the Ziptrak product actually does not have any Zips or Zippers. Acmeda is one of Australia’s largest design and manufacturing companies of systems and components for the Blind industry. In 2015 Acmeda joined with US company Rollease to become Rollease Acmeda. Their Roller Blind system has become known worldwide for a great mix of high quality, flexible design and affordable cost. 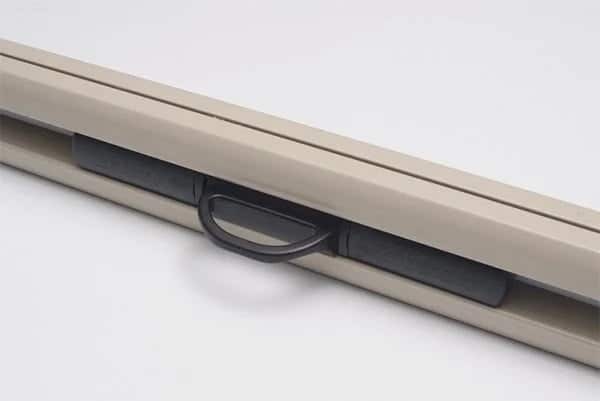 If you are reading this with an internal Roller Blind in sight there is a good chance that Acemda designed and made the components. 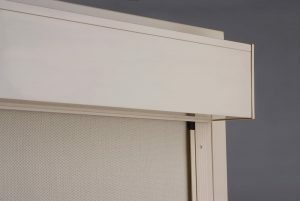 For some time Acmeda has offered an internal Zip Block Out Roller Blind system often called Shy Zip. 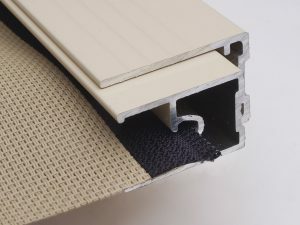 With the success of Ziptrak Outside Blinds, Acemda decided to design a competitor product using the same zip based ZLock technology used in the Shy Zip internal system. This design work culminated in Zipscreen system Version 1 which was released in a limited way approximately 2 years ago. A number of small issues were found after the first release especially relating to the top funnel system so they released Version 2 which solved the limited number of issues. This is part of Rollease Acemda’s focus on Outdoor shading systems and variety of sunshade Blinds. Acmeda have now released the Veue Awning range which includes Straight Drop blinds, Wire Guide Blinds and the Zipscreen Extreme system which can be used on blinds up to 7mts wide. The two photos below show a cut away of the Side Channels showing exactly how the Fabric is retained in the side channels. This is the most obvious and important difference between the two awnings. The Ziptrak blind is held using a cordura tape often called Kedar. This Kedar is high frequency welded to the fabric (not stitched as it looks ugly). This Kedar comes in 4 colours: White, Beige, Primrose and Black. The black has a tendency to fade slightly so ends up looking a dark charcoal colour. This Kedar is very strong and can withstand a lot of force which means the Ziptrak Fabric is held tightly in the channel. Advantages of the Ziptrak Kedar is that you can tighten the fabric more than the Zipscreen system. Also, the round Kedar seems to jam less in windy conditions when a Motor is used. Disadvantages of the Ziptrak Kedar is you can always see it so you have to choose a colour that will go with your area. This can be difficult at times without introducing another colour. The dark colours fade and the light colours are easily made dirty without a good cleaning option. The Zipscreen blind is held into the channel by a small zip. This is called Zlock technology. Note there is no actual zipper but just one side of a 5mm Zip. The zip is high frequency welded to the fabric and comes only in Black or Cream. The zip is slightly more slippery than the Kedar so the operation of the blind is a little lighter in fair conditions. However, the zip has a tendency to jam or stick more easily when under wind pressure. This can make it stick more when motorised. Advantages of the Zipscreen Zip is that is not seen easily as it only welded on one side of the fabric (the rear side generally) and the zip sits hidden within the Zip screen channels so it is not easily seen. Disadvantages of the Zipscreen Zip mainly relate to the zip not being as forgiving to house movement, poor installation or wind pressure on the fabric. The product can still be used in these circumstances but not as smoothly as a Ziptrak. Ziptrak Straight Drop blinds offer a great range of hold-down options including an easy to use centre release lock. Their range of Centre release locks or channel locks can be operated from inside or outside. This helps to achieve maximum usability in a range of difficult installations. 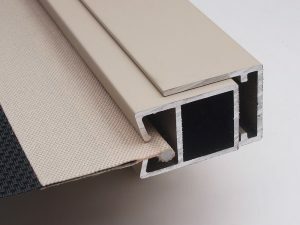 Both products use small rubber seal strips along the bottom rail to help reduce gaps. Zipscreen only offers a slide bolt bottom lock. It can be generally used inside or outside but some installations restrict the placement. This can mean that a user needs to go outside of the patio or verandah area to operate and lift the blinds. Aesthetics are always a matter of personal opinion however we often find customers prefer the look of the Zipscreen top box cassette and the more sleek side channel design. However, where a top box is not used many customers prefer the look of the open style Ziptrak blind. In a modern outdoor entertaining area, we recommend having fully enclosed top boxes as they provide the best protection for the fabric and roller components, reduce insects and look sleek. The below pictures show a few different Zipscreen and Ziptrak installation with and without pelmets so you can choose which you like best. Price is naturally an important factor in any home purchase. The two systems are generally similar in pricing however the width and drop naturally changes the price a lot. We tell customers to budget around $100 more per opening for a Zipscreen over a Ziptrak outdoor awning. Most openings are between $700-1100 depending on the options and fabrics chosen. Learn more about Stan Bond Zip Trak Blinds and Zip Screen Blinds. Both Ziptrak and Zipscreen Outdoor Blinds are great sun and weather protection options. If you are interested in learning more about the difference between Ziptracks and Zipscreens for your home or business in Adelaide call us on 08 8336 2066 or click the request a quote button. A Sales Expert can come to your home and advise you on which system might work best for your needs. One great advantage of dealing with Stan Bond is you won’t have a pushy salesperson trying to tell you one system is better because that is the one they offer. With Adelaide’s largest range of outdoor awnings, we can help you find the right one for you, not the right one for the sales guy.